Part of Cocoon's Summer in Italy series. We always take one major side trip when we are here. 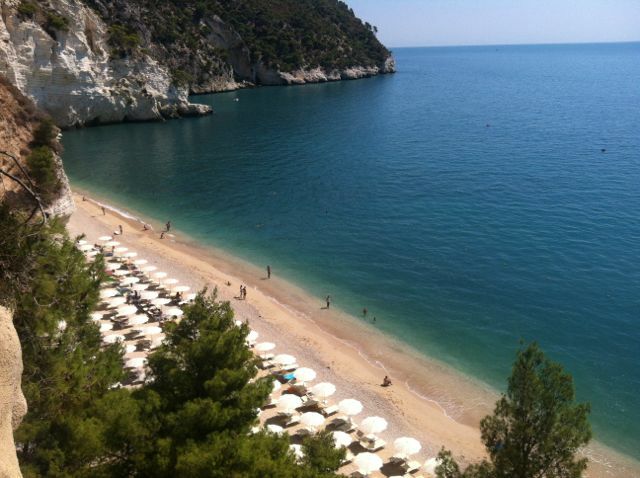 This year we decide to explore Gargano which is in the Puglia region in Southern Italy. When you look at the map of Italy, Puglia is the bump above the heel, on the Adriatic side. We stayed at a hotel in the Bay of Zagare. The views from the hotel on the cliff were stunning. We did a lot of laying on the "beach beds", swimming in the warm Adriatic Sea, and of course eating our hearts out. 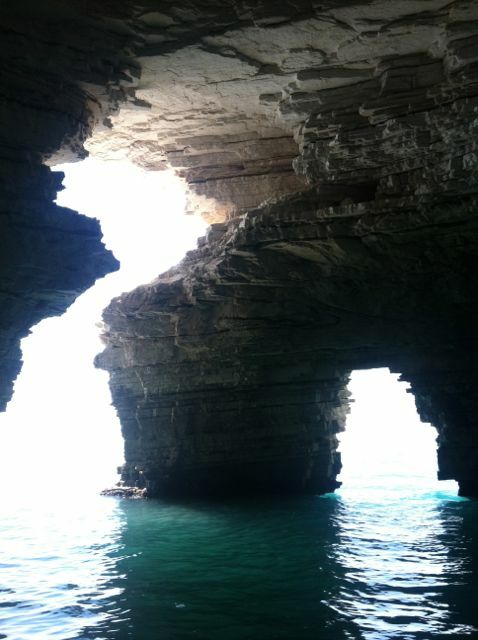 One afternoon we took a boat tour of the caves and couldn't believe the beauty. Each cave had a name such as "The Cave of the Snakes" (because there is a rock pattern that resembles a snake on the ceiling of the cave), "The Cave of All Colors", etc. Our driver, Gigi, filled us in on all the details. 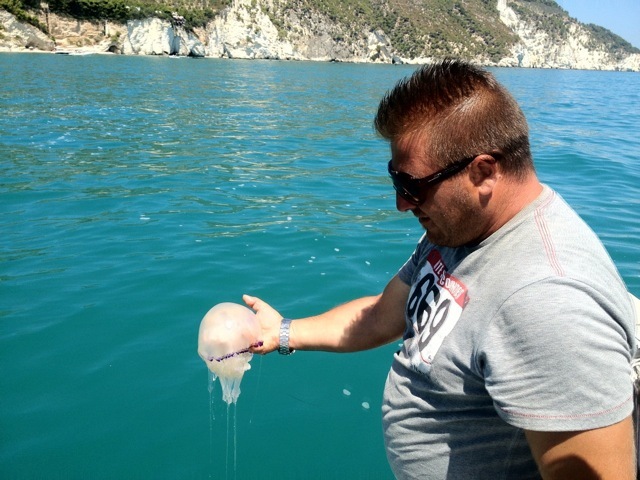 He even showed us how it was safe to pick up a large jellyfish with your hand as long as you didn't let the tentacles touch your arm! Unbelievable! 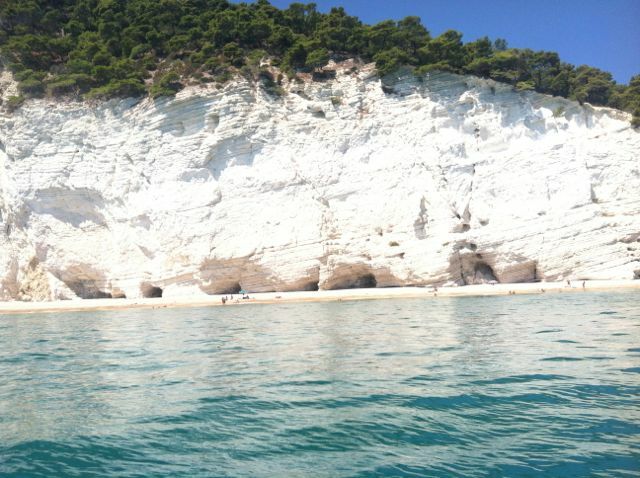 The cliff walls are white - not because they are made of marble, but because they are made of mud which gets bleached by the sun and turns white. The mud is as hard as rock, I suspect because it is petrified. Gianluca and Massimo were brave enough to jump from about 40 feet up! You can see more photos of our trip to Gargano here. Fino alla prossima volta - until the next time!